David Candler splits his time between being a doctor and collecting art. They’re two very different pursuits with a common goal – to improve people’s quality of life. David Candler was walking out of an art exhibit in the Muse d’art contemporain de Montreal when he completely broke down. He sat down on a bench, and cried – feeling a surprisingly intense release of emotions, both positive and negative. Angelica Mesiti’s Citizens Band affected him so profoundly that years later he’s still a little shaken when he speaks of the experience. “I thought of the millions of lives the work represented and the emotional content – both grief and exuberant joy – and I was overcome,” he says. The exhibit featured four large video screens playing four films in succession: A woman performed traditional Cameroonian water drumming in a deserted Paris pool, an Algerian man sang and played a keyboard on the Paris metro, a Mongolian man busked with a two-stringed instrument in Connecticut, and a man whistled a haunting Sudanese melody in his Brisbane taxi cab. For Candler, the art went beyond the beauty of the music, invoking feelings of isolation and longing, along with intense empathy for those filmed. “The power of an artist to create such effect is remarkable and so very important; they then influence and shift my view of the world and how I can impact others. Great art has the power to make us better, more thoughtful humans, in my opinion,” he says. Two years later, Candler is standing on a ladder at his own art gallery, dc3 art projects, cleaning up the area after the previous exhibit. The high ceilings give the space an open feeling, reminiscent of a public art gallery; but it’s actually a commercial space where those who view the art can also purchase the pieces. As Candler climbs to the ground, his Alberta Health I.D. swings back and forth, dancing alongside his stethoscope. He’s taking a lunch break at the gallery, helping to prepare the space for the next show before rushing back to his day job as a family physician, working with oncology patients. He typically works a regular 40 – 60 hour week at the Cross Cancer Institute, and then about 20 extra hours at the gallery. The extra hours actually help recharge Candler, though, rather than deplete his energy reserves. While he doesn’t make art himself, he consumes it voraciously, always searching for work that will make an impact in his gallery space. “Indirectly, it’s how I look after myself. It’s something I’ve identified I need in my life for myself and for other people. And it helps me to take care of myself in a job, a paying gig that’s not an easy one,” he says as a call comes through from the hospital. Art and medicine are generally thought to be pursuits that occupy opposite spectrums of the brain’s hemispheres – with the left focusing on logic, and the right on creativity – but Candler’s motivation behind both comes from a similar place. He can take care of people’s physical and emotional health through medicine, and their intellect through art. His work as a doctor, he says, is more of a creative pursuit than most would think. It involves analyzing how the illness affects people’s entire lives. He cares for people who have been admitted to the Cross Cancer Institute, managing social, psychological and medical concerns. He also visits patients in their home during the terminal stages of the disease, working to improve their quality of life. “My interest in art and the way I practice medicine are rooted in a belief that I benefit and learn from every interaction I have with others,” says Candler. Candler wasn’t always interested in visual art, but that changed after going on a trip to Oaxaca, Mexico right after completing his medical exams in 1988. Oaxaca’s streets were lined with small galleries, showing everything from ceramic installations to historical paintings. “It was work that went beyond the decorative. Work that was concerned with the bigger world-it was either highly conceptual or intellectual or emotive,” Candler says. While he acknowledges there were good galleries in the city, he couldn’t find the type of contemporary art he was seeing on a global scale at the time. He waited 25 years for someone to start showing this type of art in Edmonton, but it didn’t happen. 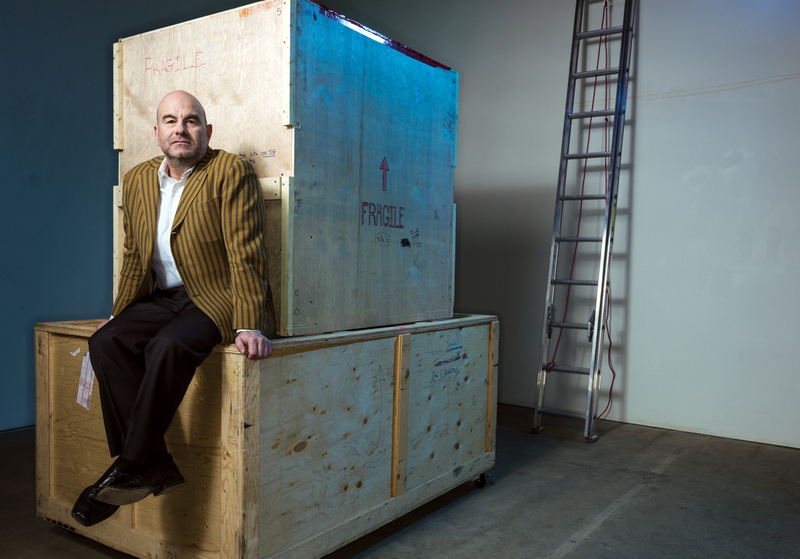 “I’ve got a million theories on why it didn’t happen,” says Candler, saying Edmonton had a strong visual-art collector base in the late ’70s and early ’80s that started to dry up along as many financial pockets were tightened. There was less collecting going on institutionally, personally and corporately. “I think that stunted a lot of dialogue about visual art, and even how we look at being a part of the bigger world,” he says. It was rare that people looked at Edmonton as a place where artists could be a part of the larger conversation, and Candler wanted to change that. He wanted to elevate artists by raising the local bar, so they could aim higher with their careers. He set to work and created dc3 art projects, a commercial art gallery, in 2012. Since then, he’s facilitated artists attending pop up exhibitions in Montreal and Los Angeles, along with art fairs in Montreal, Toronto and New York. “Edmonton has an amazing well of talented, passionate artists, but we lose a lot of them unnecessarily because we’re not good at cheerleading our own until they become a success somewhere else. Then, we try to recognize them after the fact. I want to have ridden that bandwagon right from the start,” says Candler. It’s only been four years, but Candler has already witnessed impressive growth in the careers of some of the artists he’s supported. 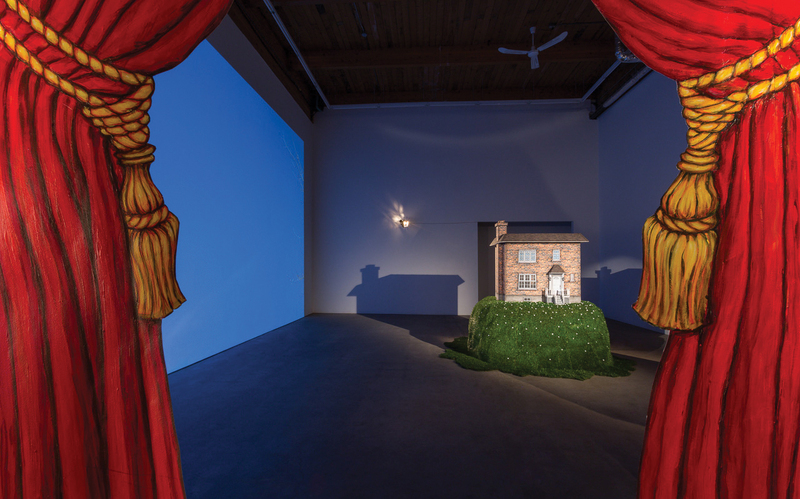 Travis McEwen and Craig Le Blanc did a joint show at dc3 in 2013 called What Makes a Man, which explored social issues surrounding gender. McEwen will be doing a residency in Los Angeles next year that dc3 helped put together; he’s also taught a course at Concordia in Montreal, and had several high profile shows. Meanwhile, Le Blanc’s work has been featured in shows at the Museum of Contemporary Art in Toronto, at the Ottawa Art Gallery, and the Art Gallery of Nova Scotia. Now, he’s back at dc3 with another show until December 10 and McEwen will return in 2017. After finishing art school in Halifax, he moved back to Edmonton, followed by a move to Calgary where he taught at the U of C, but he could not find similar support of his work. Many commercial galleries, he says, do show interesting work, but often they do not have the infrastructure for larger installations or sculptural art. And he believes many worry that more provocative pieces will not sell as easily as decorative art that people can easily hang in their home. 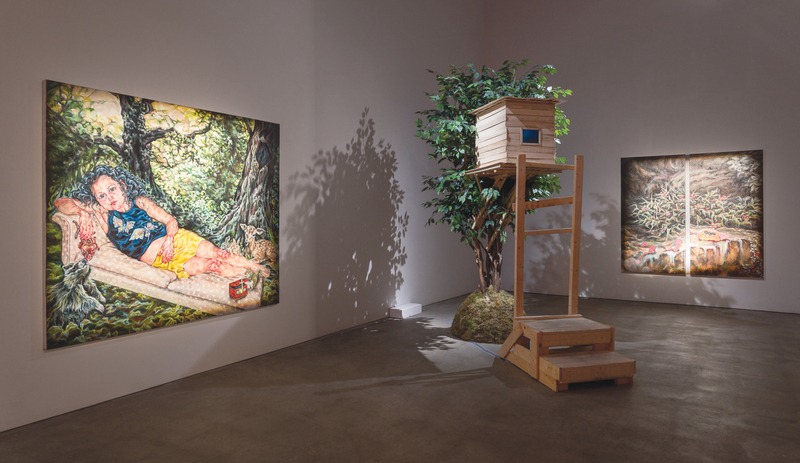 The gallery has shown a diverse collection of art – Amalie Atkins used film, textiles, installations, performance, and photography to tell stories; Gary James Joynes created films that reflect visual representations of sound; Sean Caulfield’s illustrations blended man-made and biological processes. Of course, Candler doesn’t do all of this work alone. Director Michelle Schultz takes care of the day-to-day operations of the gallery, along with helping to secure artists for the space. Schultz and Candler first met through Latitude 53 when he was on the Board of Directors and she was on the Special Events Committee; they kept in touch over the years. Candler came to London when Schultz was there, and they toured the art galleries for a week. Eventually, Schultz moved back to Edmonton to join Candler at dc3. Her background includes opening a gallery in London with three fellow graduates after completing her MA, and running an emerging contemporary art gallery in Los Angeles for three years. “I’ve had to explain to people walking into the gallery that yes, in fact, that 11 foot white felt yurt [a round tent] with a crushed glass floor is for sale (in reference to Amalie Atkins’ Three Minute Miracle). David’s work as a doctor allows us to take risks in programming that other galleries may not be able to. We are in this for the long-game, not to sell out a show,” says Schultz. One of their first shows included a painting by Tammy Salzl of three women crouched around a deformed male. The work addresses the use of chemicals – pesticides, cosmetics, flame retardants, to name a few – which are affecting hormone levels in many species. The painting is supposed to represent the earth a few hundred years down the line. One woman, who saw the piece, was incredibly offended and questioned why they would carry something so disturbing. But Candler explains the idea behind the painting; and in the end, he realized her violent reaction was actually an argument for the importance of the piece: that it creates a dialogue. “In my years of looking, travelling, reading and collecting, the works that I had an immediate likeable response to, they often didn’t hold time well. Whereas, the works that I felt really deeply about – sometimes in a negative way – are the ones that come back over and over again. They’re the ones that wake me in my sleep,” says Candler. Candler hasn’t been as affected as he was by a piece of art since that time in Montreal. But now every day, he takes part in work that inspires and challenges him. His lunch break is over, so it’s time to head back to the hospital where he needs to check on several patients. 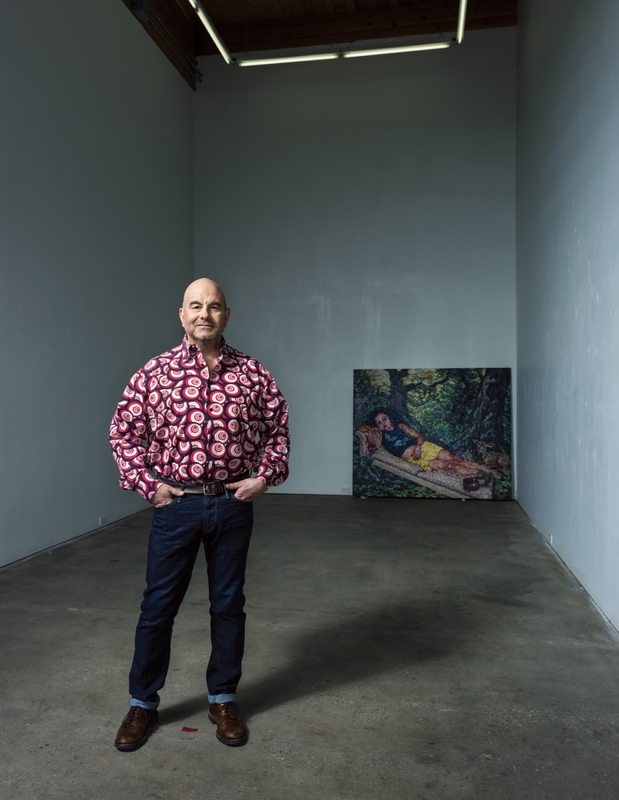 It’s a big change from the gallery, but Candler says his work as a doctor is about more than just keeping track of physical problems – he analyzes the whole picture, and how the illness affects many aspects of their lives. In both pursuits, Candler uses both logic and creativity to dig beyond the surface and further his emotional, physical and intellectual understanding.